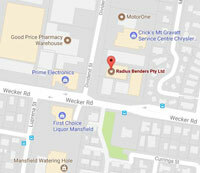 Over 40 years experience in the industry makes “Radius Benders” an authority in the field of tube and pipe bending and rolling in Australia. Designing and manufacturing pipe and tube bending machines in our Brisbane factory since the early 1970's, our machines became the industry standard. During the 1990's we expanded our services into contract bending and rolling services of tube and pipe work. No job is too small or too large or too complicated. Radius Benders also specialise in prototyping and fabrication. We know bending and machines inside out. Our customers feel comfortable with our expertise and knowing they will get the job done right. As the exclusive agents in Australia and New Zealand for CSM Tube and Pipe Bending Machines, and TradeMax Tapping Machines/Arms, Radius Benders offer full backup service, support and training. Furthermore, as part of the Radius Benders group of companies, we service other industries with the premium names of “The Letterbox Man” and “Top Line Concrete Tools”.